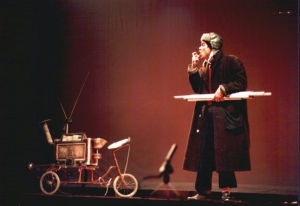 Kevin Brooking presents a mime, music, juggling and magic act whom the French have compared to Chaplin and Mack Sennett (in France, there is no higher praise). Before graduating from Ecole Jacques Lecoq in Paris, Kevin worked as a circus clown in Canada, Mexico, USA England and at Germany’s Circus Krone. Kevin has trained pigs, swallowed swords, and his talented tongue was featured on BBC television. He is a founding member of circus – theater company Mummeranddada (England) and was a prize winner at the 1985 Festival Mondial du Cirque de Demain in Paris. … His stories are madly tender and abound with the hilarious and the unexpected. A review in the Swiss newspaper 24 Heures de Lausanne described him this way “The world of this American artist is a comic battle between himself, nature and physical objects. The art of this musical clown is to bring out with acting, mime and illusion, different situations and characters. It seems simple but is very powerful…” And now we have the chance to show him to our Seattle Moisture audience. We’re looking forward to this.